Hikes sorted by name start elevation end elevation elevation change length fee controlling agency region in ascending descending order. A steep trail through a spruce-fir forest up to a small lake. Along the way, might see lots of wildflowers and get some nice views. A rough but fairly level hike to and around two collapsed lava tubes. This trail takes you through an open forest containing a variety of trees such as aspen, ponderosa pine, piñon and juniper. The lava tubes to which you hike are large and long (one of the longest in North America). They are unlike anything else you will see while hiking. 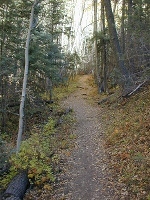 The Black Canyon trail is a short, easy lollipop trail through an aspen-fir forest. If you take this trail, you will see several types of wildflowers, and possibly lots of butterflies. This is a good trail for children or a family. This hike is a pleasant short-ish loop with some vertical relief (about 800 ft elevation change) in an aspen-fir forest. Because of the aspen, this hike would be especially nice in the fall. You could extend the length of this hike by taking one of several other trails which intersect this trail. This hike is a short but steep scenic drop from the mesa down into the Rio Grande Gorge. As you descend, you go through several biomes; the trees change from piñon and juniper to blue spruce and Doug fir. You start with desert plants and end with plants that live along rivers. Add to this the great views and sounds of the river and you have a pleasant hike. This hike connects to the nearby BLM Wild Rivers area. This easy hike is notable for being close enough to Albuquerque that you can decide at the last minute to go hike it. It also is easy enough to take young hikers. The network of trails gives you many options of places to go, and it would be hard to get truly lost here. It is a popular mountain biking area as well. A short, easy trail that ends with an excellent view of Fajada Butte and much of the rest of Chaco canyon. This hike spends most of its time in a fir forest, with wildflowers below. Much of this hike is in the shade, making it a good summer hike (although it will still be hot). To make a hike without retracing your way back, you could arrange a car on the other side and go down the west side on the Pino trail. A nice day-hike loop in the Sandia Mountains near Albuquerque. Parts of the trail are along a stream, which may have water in non-drought times. Also of interest was a travertine waterfall. 1000 year-old petroglyphs await you on this short hike near Albuquerque. In spite of the hike being so short, it has a lot of interesting petroglyphs and lava formations. This trail to the Gila Cliff dwellings is a one-mile hike with a small amount of elevation gain that provides intimate views into the former dwellings of native peoples that inhabited the area from the 1280s through the early 1300s. The cliff dwellings are situated approximately half-way up the south-facing cliff and one can imagine the area full of people grinding corn, preparing skins, talking, playing, and carrying out the many daily activities of life. The trail along the cliff dwellings is not shaded, so one can warm up on this part during the winter, and cool off in the summer as one enters the shaded dwellings. Nice views are obtained from the dwellings. Ranger-guided tours provide a wealth of detail about the people who lived here in the past. This easy hike is notable for the wildflowers, ending in meadows of flowers. The flowers attract butterflies and other insects. In contrast with many hikes along streams in New Mexico, the stream crossings are on bridges, not slippery rocks. Both natives and people visiting Albuquerque hike this easy trail for its spectacular views. If you hike this trail, you will be rewarded by views of Albuquerque, Mt. Taylor, the Jemez mountains, the Sangre de Cristo mountains, the San Pedro mountains, the Manzano mountains, and Ladron peak, just to name a few. In the summer you can enjoy the wildflowers along the trail. At any time of year you can experience the history of the CCC by visiting the Kiwanis cabin. You can hike from the Crest parking lot to the terminal and restaurant at the top of the tram. Or, ride the tram up and hike it the other way. The trail is well signed, and in spite of the collection of trails all over the crest, it is hard to get lost. In fact, this collection of trails makes it possible for you to do different parts in each direction for much of the hike. People who take this hike are rewarded with views both distant and local. The distant views include White Sands, the Tularosa basin, and the Organ and San Andreas mountains. The more local views are the spectacular wildflowers, especially in the spring. If you hike all the way to the top, you have climbed the western escarpment of the Sacramento mountains, getting an excellent workout. As you climb, you are going going through rocks (primarily limestones) that get younger as you approach the top. About halfway up, you reach the cabin built by a rancher many years ago, providing a historical element to the hike. The El Calderon Loop trail is a scenic trek past several caves, sinkholes, lava trenches, and a cinder cone. This trail is different from many at Bandelier National Monument. Take this trail for plants, animals, and geologic scenery, including the namesake falls. You get a view down to the Rio Grande, but you can no longer get there after the flood in August, 2011 destroyed parts of the trail. A nice loop from a piñon-juniper forest changing to a ponderosa-fir forest as you slowly climb the southern Sandias. In wetter years, you are likely to see many wildflowers. Of particular note is the good view of Cedro peak and its environs. One of the more interesting facets of this hike is the small shelter cave near the trailhead. A stream parallels the first few hundred feet of the trail. The trail is well-marked, easy to follow, and nicely clean. In years past, all visitors took this route into Bandelier. Since the road was built, many people are missing the great views that this trail provides. A short loop trail to a pueblo that tree ring data indicates was built 1431-1447. In addition to the ruins, you also get good views of the canyon bottom, and views in all directions from the mesa top. This short, interpreted nature trail lives up to its name: Grande Vista, or, (loosely translated), "great view", which you do get from this trail. Additionally, you get to learn more about the nature in the area. Due to the 2011 fire, this trail is closed. You should check with the park before planning on hiking this trail. A short loop around the Holy Ghost campground. If the weather has been right, you will be rewarded by an amazing diversity of wildflowers. If you are staying at the campground, this is a loop you should consider. A trail with excellent views of the Sangre de Cristo, Jemez, Sandia, San Pedro, and Ortiz mountains (i.e., views in most all directions). This trail gains 855 ft (261 m) in the first 0.94 mi (1.5km). However, the climb is worth it for the views. A relatively flat trail with excellent views of the Valle del Rio Mora. In the fall, excellent colors await you. This hike gives you a chance to see the unique geologic formation known as tent rocks. If you do this hike, you also go through a slot canyon and up onto the mesa, leading to great views of the Sangre de Cristo and Jemez mountains. A short, easy hike to New Mexico's second-largest natural arch. If you are in the area, make the short stop needed to see the arch. A short trail which leads you past some amazing lava formations. If you are in the area, you really should take this trail. A hike through piñon-juniper along a ridge with great views, and then through a dramatic slot canyon to the Gila River. A great day hike in the Gila Wilderness. The Mesa Point Trail in Boca Negra Canyon is a nice trail near Albuquerque. You can view 1000 year-old petroglyphs, as well as get nice views of the city and the Sandia and Manzano Mountains. This hike gives you a very different view of the lava flows that make up El Malpais than most hikes---you are 500 ft above them and looking down. You also get a great view of La Ventana Arch. Hike this hike for the views. You will not be sorry. This hike goes from White's City to the visitor's center at Carlsbad Caverns National Park. When you hike this trail, you can see much of the native plants (blooming if you hike it in the spring and the rains have been favorable). You also get good views of the gypsum plains below and the Guadalupe Mountains stretching off into Texas. 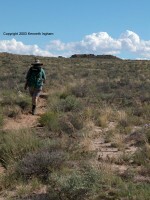 This trail is one of the more famous trails at Chaco Canyon. It goes past a pictograph which may represent the 1054 Supernova that created the Crab Nebula that we see today. Besides the famous pictograph, the trail also takes you past petroglyphs, some of which are the inspiration for some of the park signs. 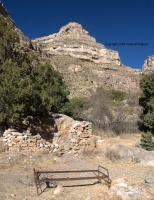 This trail also goes to Peñasco Blanco, which is one of the outlying ruins in the park. This trail in the northwest portion of the Sandias takes you to places with excellent views of the Sandias and the Jemez. When we hiked, the view of the snow on the mountains against the deep blue sky was spectacular. When snow is not an issue, this is an excellent winter hike, although if done early it would be good in the summer as well. This trail requires a car at both ends (or hike there and back). A nice hike with a moderate elevation gain (2760 ft/842 m) up the west side of the Sandias from the Elena Gallegos picnic area. Much of this hike is in the shade, making it a good summer hike. To make a hike without retracing your way back, you could arrange a car on the other side and go down the east side on the Cienega canyon trail. An easy hike near Los Alamos that ends with a nice view of the Rio Grande. On this hike, you get nice views of the Sangre de Cristo mountains, Jemez Mountains and the Rio Grande. This hike is probably the best hike in Chaco Culture National Historic Park. On it, you go past three different sets of ruins (Kin Kletso, Pueblo Alto and New Alto), and you get wonderful views of Kin Kletso, Casa Rinconada, Pueblo del Arroyo, Pueblo Bonito, and Chetro Ketl from the cliff above. You can also see up and down Chaco Wash, and have good views of other parts of the San Juan Basin as well. On this hike are interesting rock formations, including iron-rich fossil worm castings and slot canyons. Plus, you get to see the Jackson Staircase, which is a staircase carved into the cliff wall. You also twice see segments of the famous Chacoan roads. If you only do one hike at Chaco Canyon, do this one. 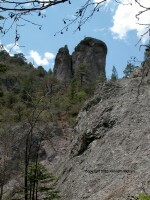 This trail is a short loop in the Gila Wilderness. Expecially notable is the narrow canyon that part of the trail runs through. If you hike this trail, you will encounter a pleasant canyon that can take you all the way to Hillsboro Peak or other places in the Aldo Leopold Wilderness. One of our favorite hikes in Carlsbad Caverns National Park, this hike is notable for great canyon scenery, a variety of cacti and other desert plants, and some history. A great day hike that goes through several biological zones in the Manzano Mountains. This forest that this hike goes through was damaged by the Ojo Peak fire in 2007. At the top of this trail, you are on the rim of the Valle del Rio Chama. You get amazing views of the valley, the Ghost Ranch area with its colorful geologic formations, Abiquiu Lake, the Jemez, and the Sangre de Cristo mountains. When it comes to views, this trail is probably one of the best in the state, and this is really saying something. An easy trail in Albuquerque offering excellent views of petroglyphs. Like the other trails which are part of the Petroglyph National Monument, (Cliff Base and Mesa Point), you get to see many petroglyphs. However, this trail is longer, and gives you a bit more exercise and different petroglyphs. This hike is a less-structured hike than many we write about. However, a repeated note we took when hiking summarizes one of the reasons to hike: interesting geology. Arches, shelter caves, a slot canyon, interesting inclusions of agate(? ), and interesting rock formations are some of the geological features that you can find on this hike. The other note that shows up often is the contrasts of this area. The cottonwoods, which indicate a reliable water source contrast with the cactus that can easily survive without one. Something interesting is around every corner. A longer hike at Chaco that takes you to an outlying site and then and through a canyon with interesting geology. This hike sees fewer people than many of the other hikes at Chaco Culture NHP. This easy hike near Albuquerque is a good one for seeing wildflowers, as well as the occasional squirrel or other wildlife. The Three Rivers petroglyph site contains one of the most numerous collections of petroglyphs in the nation. Of the various petroglyph sites in New Mexico we have visited, this site has by far the most. BLM says that there are over 21,000, and many are in excellent condition. In addition to the petroglyphs, you also get great views of Sierra Blanca and the Tularosa basin. An easy loop trail at Rockhound State Park. On this trail, you get nice views of the campground, and off to the southwest through northwest, including nice views of the Big Florida mountains. Many people use this trail as a starting place for their rock collecting. This trail also has many interesting forms of cacti and other desert plants. A longer loop in the Sandia Mountains that takes you through several vegetative zones. The variety of vegetation, including wildflowers in the spring, makes this hike worthwhile. Add to it the views from the Crest Trail, and the result is an excellent all-day hike. The Tres Pistolas trail is an excellent winter trail, because it faces south---snow melts quickly from it. You can get a good workout by doing the trail quickly (as some runners do), or you can take it more slowly, looking at the views south and the plant and animal life. If you set up a car at each end, you can hike down the Embudo trail. Hike this hike for the views of Cabezon and the Jemez and San Pedro mountains. 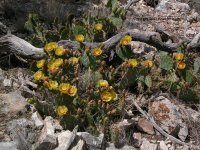 If you hike in the summer, you will also be rewarded with many varied cactus blooms. A flat hike that goes past two small archaeological sites and ends up with great views of the canyon and Tyuonyi. If you are camping, take this hike at sunrise or sunset.